So wrote T.S. 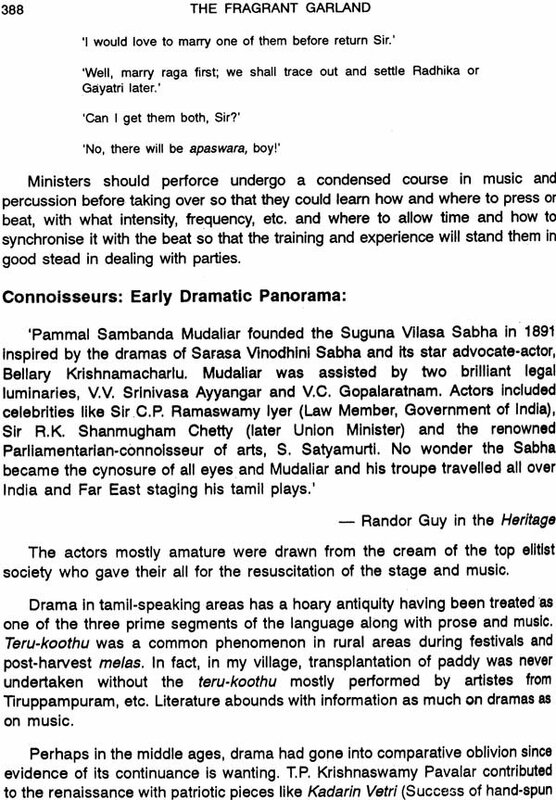 Parthasarathy, the eminent musicologist and Secretary, Music Academy, Madras on July 6, 1992, When I commenced the yagna of bringing out the first-ever Biographical Dictionary of Carnatic Composers and Musicians of the past and the past and the present in English uninhibited by constraints of geography, race, caste or creed in 1988. I was not fully aware of the full implications. I had not the remotest idea, nor was ever there the possibility, of my pursuing relentlessly this massive and multi-dimensional work of bring out such a publication. The need for such a book has been felt for long and it has been the Divine will as T.S. 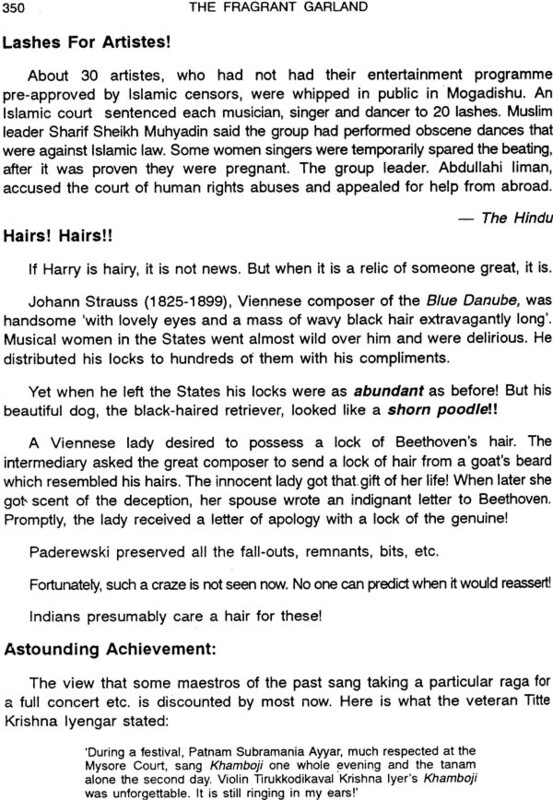 Parthasarathy avers that I should take it up, who else could? This assumes particular significance in the context of men of eminence having made references to the lives of some composers and musicians though very briefly in their works. The venerable Subbarama Dikshitar, author of Sangita Sampradaya Pradarsini, the eminent Dr. U.Ve. Swaminatha Ayyar, father of Tamil Research, M. Abraham Panditar, author of the colossal work Karnamrta Sagaram, Prof. P. Sambamurti and Dr. V.S. Sampathkumaracharya had all moved in the direction in some way or other but in a highly restricted way. Newton was the one to ask why. 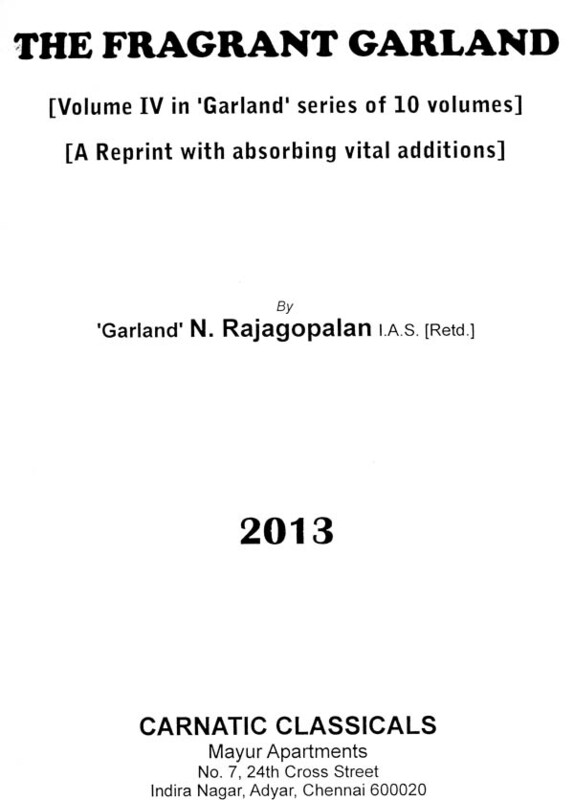 The Garland series cover as many as one thousand four hundred lives and rightly the pioneering work has been described as a ‘treasure-house of information’, ‘a source book’ and a ‘vital book of reference’. There is none else of such magnitude and perhaps there may be none! Sunil Gavaskar proudly claimed that he was the first to reach the ten-thousand runs mark but mark but Allan Border crossed it soon after and it may be a distant day for any to break it! They say records are meant to be broken! How I wish that the record of the Garlands is broken! It has indeed a challenging herculean task to do the job alone, like the proverbial Ekantapuram Station Master, without help –governmental or institutional, monetary and secretarial. By its nature, the work is one of colossal dimensions involving heavy correspondence, visits, contacts, etc. Artistes too have little time to respond to requests. The four volumes have consumed nine years of my brief tenancy on this great land, the Bharat! Science or Art, noting attains its sampurnatvam, culmination of glory, acme of excellence or the grandeur of its inherent sublimity in the absence of great masters, maestros and wizards who contribute its soul and substance. One lacks the will to ignore the urge to admire once more their enduring contribution and the effulgent legacy they have graciously legated. 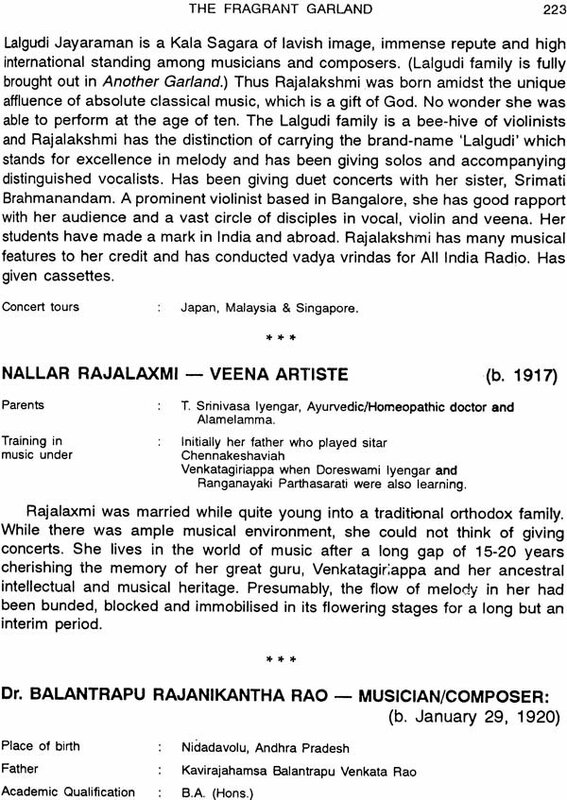 (Do not rasikas relive the experience of an enthralling concert and do they not long to hear their favourite artiste sing a particular place over again? 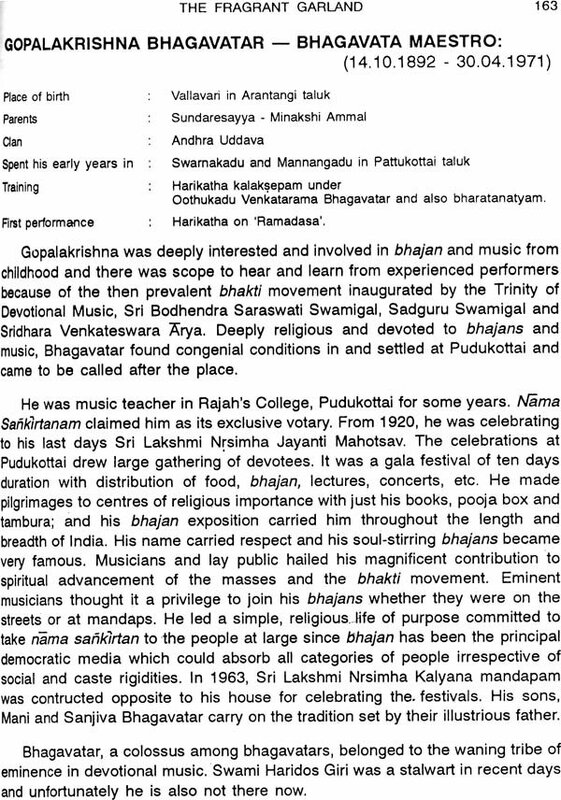 Does not Nandanar of Gopalakrishna Bharati long and sing for just another vision of the Lord-yes, just one more!) Not that what had been said earlier was defective but what has already been said just tickles the conscience to feel that sufficient story had not been reeled out yet and it yearns for more! God is one, religion protest; but does not man create different gods highlighting individual aspects of his choice Even so, the lives of a few, who have left impressionable imprints in the sphere of the oldest living science and without whose advents art would have surely been the poorer, find a place herein but from different angles. There has often been a suggestion to limit the dictionary to the all-time greats and the stalwarts of the day only. But it is unfair to exclude those in the second-line who are to ascend the ladder to occupy the top slots tomorrow. It is also a perplexing job to draw the dividing line. What is popular may not also be the traditional. Audience-response too gives little guidance. Critics laud the performance of most of them even as they express their dismay at and lament vociferously over the fall in standards! 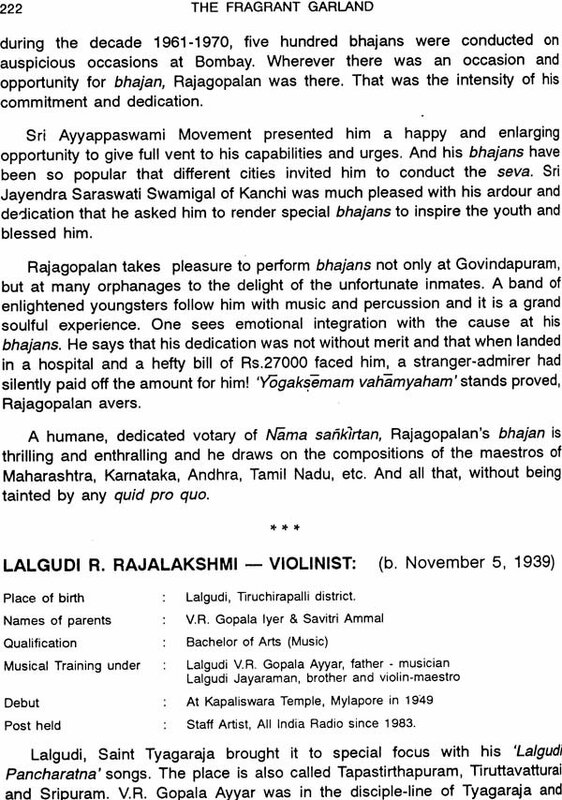 Some musicians give prominence to lakshana while others to lakshya. 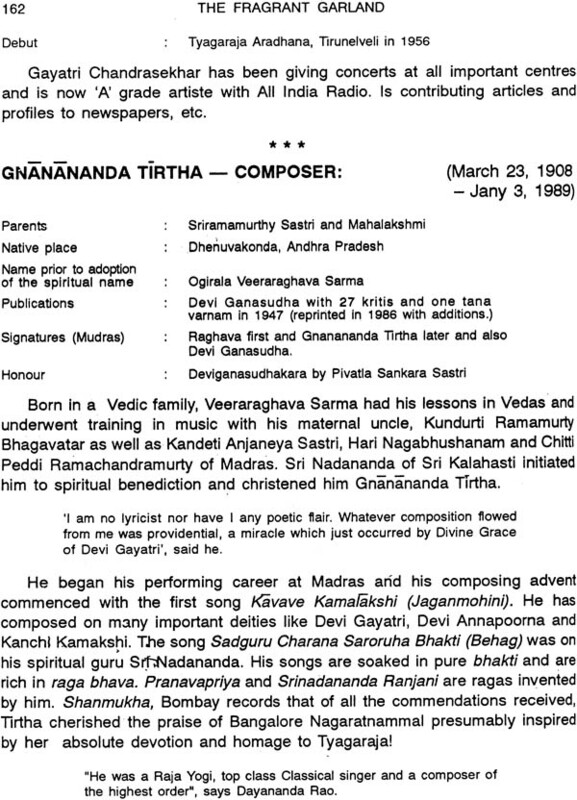 Some suggested separate volumes for composers and for musicians Were Maha Vaidyanatha Ayyar, Patnam Subramania Ayyar and the like composers or performing artistes? The same issue confronts many cases such as those of Gopalakrishna Bharati, Harikesanallur Muthiah Bhagavatar, Lalgudi Jayaraman, Thanjavur Sankara Ayyar and scores of multi-dimensional lives. Thus the suggested classification has not been found easy to implement. The society owes a deep debt of gratitude to those masters of the glittering galaxy of the past who rejuvenated and revitalised the art from time to times ignoring personal pangs and pains, hunger and pains, hunger and privations in a greater or lesser degree. What were their lives like? It was succinctly by Sangita Kalanidhi T. Chowdiah that many villages had boasted of musicians of eminence but that many of them did not know where the next meal would come from! 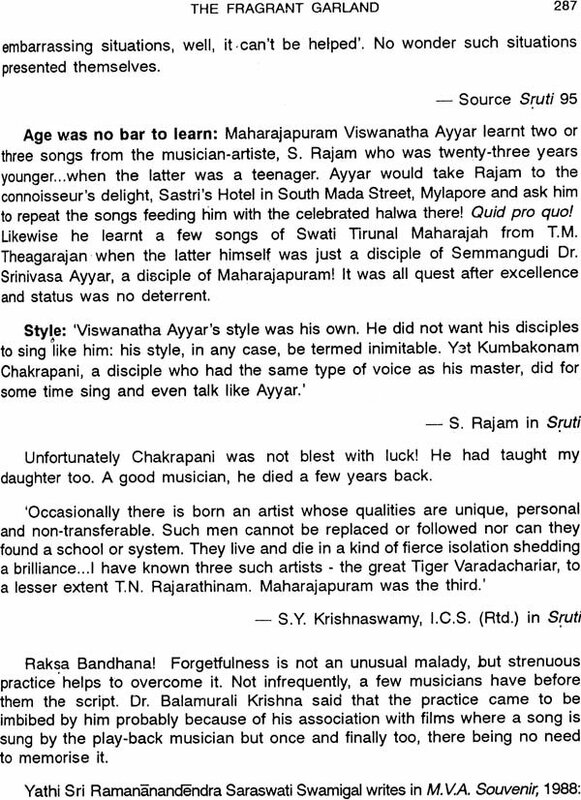 Simizhi Sundaram Ayyar and many others are hailed as titans but they were all left severely alone. 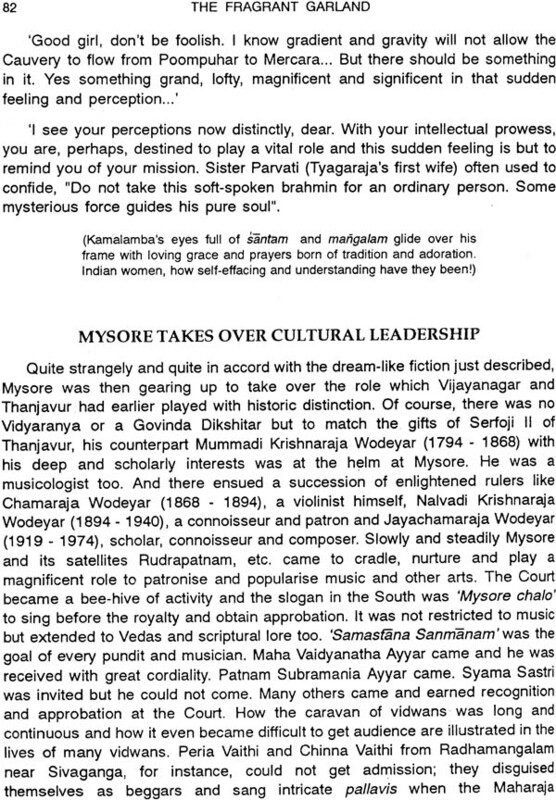 Mudicondan Venkatarama Ayyar was described by Dr. Semmangudi Srinivasa Ayyar as ‘musicians’ but the hard fact remains that he was not supported well. 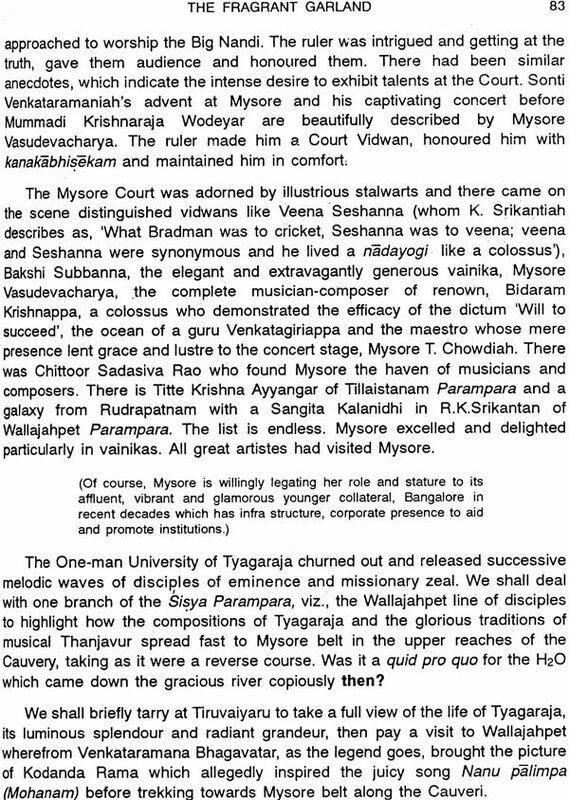 The Prince of Karnataka vainikas, Shamanna in his early days had ‘roamed about the streets carrying the vina on his shoulders (like wood-cutters ploughmen) looking for homes with festoons for a chance invitation to play!’ What had Tyagaraja or Dikshitar got in material terms for the glittering legacy they left behind? 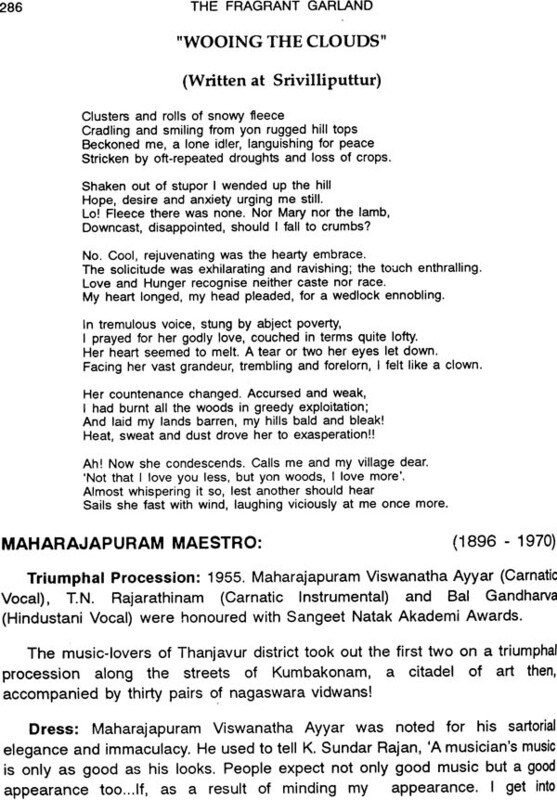 Maha Vaidyanatha Ayyar starved to preserve and insure his golden voice though he could have commanded a royal table. 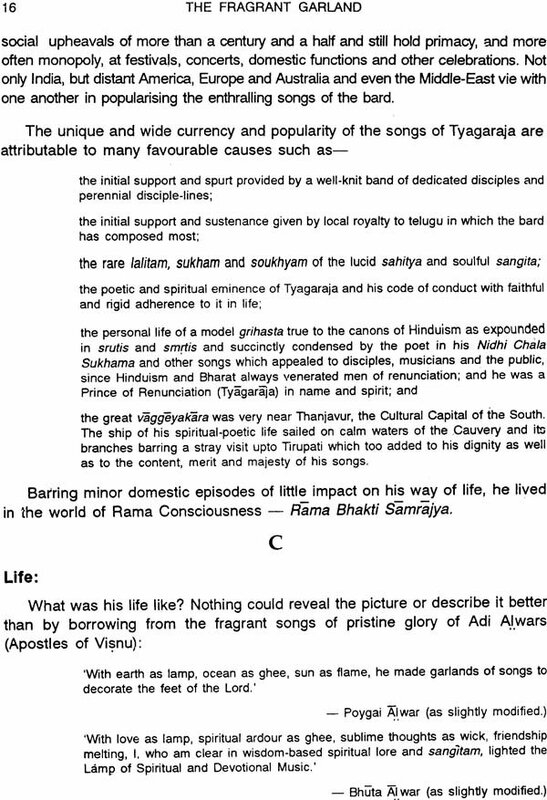 What were indeed the private lives of Mahakavi Subramanya Bharati or of his mentor Gopalakrishna Bharati like? Their cerebral and effulgent poetical and musical fires ahd learnt to stifle the pangs of physical hunger and wants. Of course, conditions were similar and perhaps worse in the West too. Mozart could not provide for a decent burial to his beloved nor for his own but his manuscripts were sold for a hefty 2585000 recently Beethoven did not stir out of his only pair of shoes repair! The simple lives of most musicians and composers did not see milk and honey flowing in their homes. 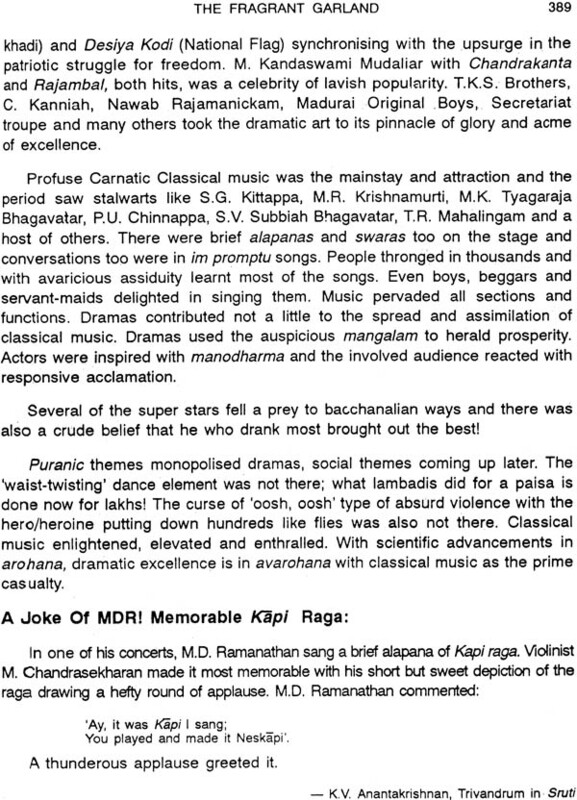 Musical affluence was in inverse proportion to material prosperity. And they bore with equanimity all sufferings to promote, enrich and ennoble art; (it was all Krisnarpanam) and they knew not what else to do! Their commitment and marriage to the fine art were as irrevocable as hindu marriages were them! How many Tyagarajas, Dikshitars, Bharatis Rajarathinams should have languished in chill penury! 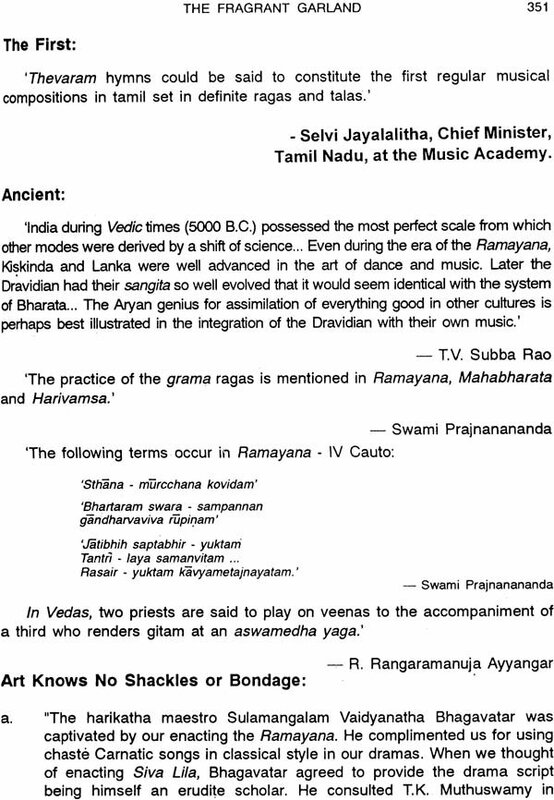 Why all the jayantis, aradhanas, etc. now? One sees fascinating photos with fragrant garlands on and witnesses memorial functions aesthetically arranged. Pious tributes are paid since man has not learnt of any other mode or means of honouring and remembering the remarkable legacy of the great and discharging the great and discharging the deep debt of gratitude he owes! ‘On some fond breasts the departed souls rely! Some pious drops the departed require! Large was their bounty and their souls sincere. They gave to art all they had perhaps they gained from Heaven (was it all they wished?) immortality and a silent rest!’ (Thomas Gray as modified.) I have hastened to include as many of the past veterans as possible before the ravages of man, memory and time obliterate the frugal information now available. They canalized their energies and the glittering ingenuous flame in them to promote sublime, soulful music, arts, emotion-packed paintings and speaking sculptures, ageless architecture, etc. What a magnificent array of creative assets have they legated! Part II-A: The Cavery flows westwards!